After the summer American Astronomical Society (AAS) conference in San Diego came to a close, AAS press officer Rick Fienberg generously invited the Astrobites team on a special press tour of the legendary Palomar Observatory. Astronomers have observed from atop Palomar for 80 years, starting with the 18-inch Schmidt telescope in 1936. In 1949, the iconic 200-inch Hale telescope had its first light, and continued its reign as the largest telescope in the world until 1993. Yet, the high-quality optics of this 67-year-old telescope and state-of-the-art cameras and adaptive optics system allow this telescope to still make major contributions to the field. Packed in a passenger van, we left on our excursion. Mt. Palomar jutted out of the California landscape, its summit over a mile above sea level. By small, winding roads we scaled the mountain to the observatory site on the mountaintop. The dome of the 200-inch Hale Telescope was a sight to see, and pictures can hardly do justice to its immensity. For the Hale, the dome stretched 41 meters tall and 42 meters wide. We started our tour by entering the dome at ground-level, which leads to a large room underneath the telescope. The structural supports – one for stabilizing the 530-ton telescope and one for the 1000-ton rotating dome – cut through the room and plunged deep underground into the underlying bedrock. From here, we climbed up stairs that led us to the massive telescope. The 200-inch Hale Telescope. Photo credit: Gourav Khullar. 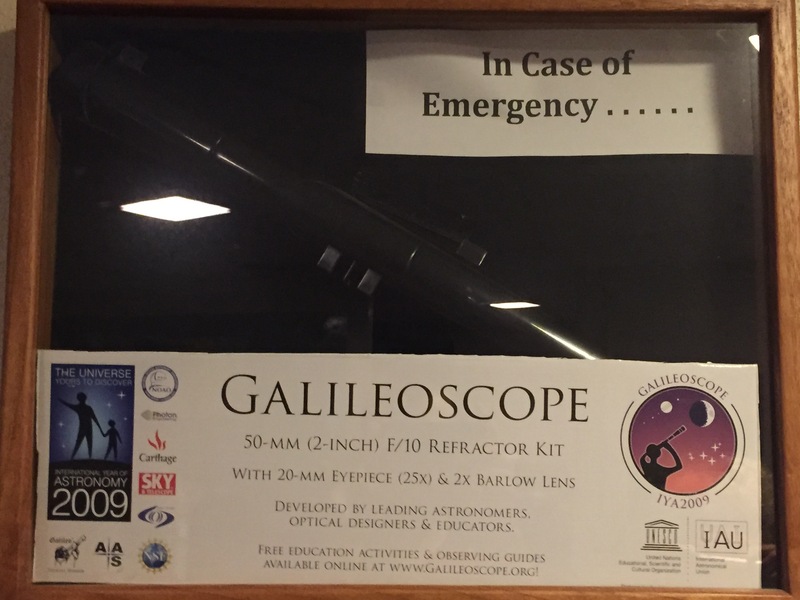 As an astronomer, I often have to explain the sheer size of large, research-grade telescopes. However, seeing one in real life rather than in a textbook or on a webpage is still a bewildering experience. The 5.1-meter telescope has a 1/2-degree field of view (the size of the full moon on the sky), and is mounted by an equatorial horseshoe mount, consisting of two long, diagonal beams on the east and west sides of the telescope, with U-shaped support to the north that allows the telescope to dip down to the north celestial pole while maintaining its structural integrity. After staring at the towering telescope like a deer in headlights for a few minutes, our guides brought us to a control room filled with computers for telescope operators to monitor the telescope and for astronomers to do their research. Thankfully, there was also a backup telescope (created by the AAS press officer himself) in case the Hale ran into problems! After exploring the observatory, we ventured to the accompanying museum where we had the chance to chat with astronomers that do research using the facilities atop Mt. Palomar. First, Lin Yan of Caltech told us about the intermediate Palomar Transient Factory (iPTF). This project uses all the telescopes on the site to uncover variable astronomical events and objects, such as supernovae, variable stars, and near-Earth objects. Smaller telescopes on Palomar, such as the 48-inch Samuel Oschin telescope, play a large role in the iPTF due to their larger field of view. The future of the project will build on the highly successful legacy of the iPTF with the Zwicky Transient Factory (ZTF) in 2017 – a time-domain survey on Palomar using a new camera with an 8 times larger field of view and the ability to image objects down to a visual magnitude of 21. Next, David Cook of Caltech discussed the Census of the local Universe (CLU), which is working to acquire a very complete sample of galaxies up to 200 million parsecs (~600 million lightyears). So far, about 250,000 galaxies have been observed and mapped. At design sensitivity, advanced LIGO will be able to sense gravitational waves emanating from neutron star-neutron star mergers up to this distance, so the CLU paired with the ZTF may be integral in detecting electromagnetic signals associated with such events. David Ciardi of Caltech then introduced Palomar’s connection to exoplanet research. Using the Hale telescope to follow up on planetary candidates uncovered by the planet-hunting Kepler Space Telescope has helped to rule out ‘planetary mimics’ (i.e. false-positives in Kepler candidates) such as background eclipsing binaries and hierarchical triples, which has in turn led to the confirmation of hundreds of planetary candidate systems. Though the Hale telescope is not equipped with a laser guide for its adaptive optics system, when observing planetary candidate host stars these stars themselves can act as guides to allow for adaptive optics corrections. In the near-infrared that is used to examine planetary candidate host stars, the adaptive optics on Hale allow the telescope to reach its diffraction limit of 0.1 arcseconds. Lastly, Rebecca Openheimer of the Natural History Museum of New York discussed cutting-edge instrumentation that is being used at Palomar. In particular, she highlighted Project 1640, which utilizes adaptive optics and a coronagraph on the Hale telescope to directly image exoplanets. Using this technology, the Hale has done full reconnaissance of the star system HR 8799, including imaging and spectra of its four confirmed planets. 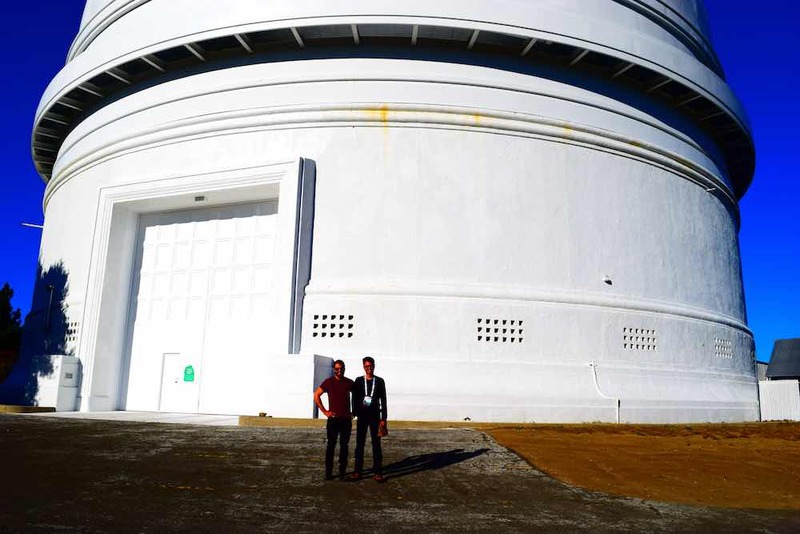 Astrobiters Mike Zevin and Gourav Khullar in front of the dome of the 200-inch Hale Telescope. Photo credit: Gourav Khullar. Mt. 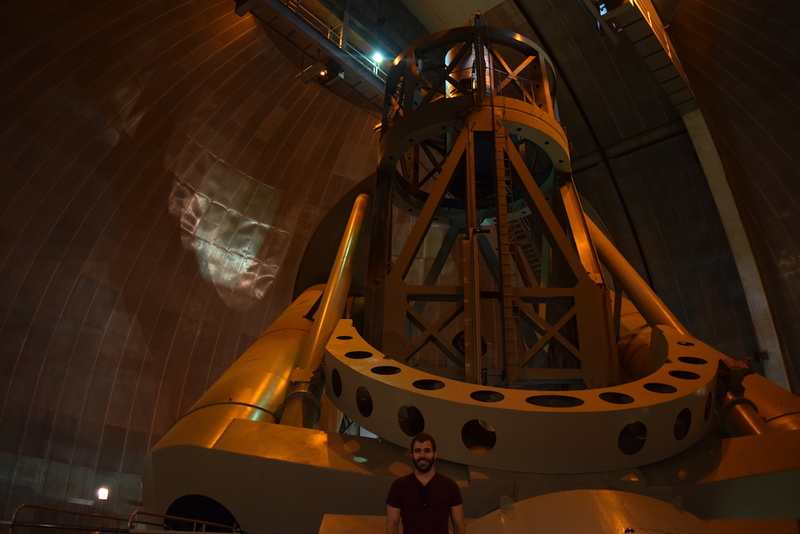 Palomar is such an iconic piece of astronomy’s history, and I found it incredible that its telescopes are still such an important part of astronomical research. Astrobites was very grateful for the opportunity to experience a truly timeless machine!